Dagenham & Redbridge: Cousins, Nunn, Robson, Robinson, Howell (Kandi 67), Adams, Okenabirhie (Bloomfield 90), Sparkes, N’Gala, Cheek, Howells. Subs not used: Moore, Bloomfield, Gordon, Bonds. Chester: Hornby, Halls, Astles, Hobson, Waters, Crawford, Anderson, Roberts, Vose, Archer, Hannah (Akintunde 79). Subs not used: Firth, Mahon, White, Dawson. If ever there was a sense of ‘deja vu’ about a match, then the closing spell of Dagenham v Chester epitomised the very definition of the phrase. Last February the Blues were 2-1 up with four minutes to go, only to fall victim to a 3-2 defeat. So it was gutting to see the end of this game prove to be a near replica of last season’s collapse. On a freezing day, the game started well enough for Chester with Dominic Vose immediately looking like a class above most of the rest of the players on the pitch. Despite that, it was the home side who went ahead on the 11th minute when Fejiri Okenabirhie found himself in enough space on the edge of the area to score a great goal. Chester didn’t let their heads drop though and a good chance saw a Matty Waters’ shot just go over the crossbar. Soon after, they did find the net when a well-placed cross from Gary Roberts was struck sublimely by Jordan Archer to put the Blues back on level terms at half-time. Not long after the re-start, Ryan Astles saw a powerful header from a Roberts’ corner go past the post. Ross Hannah also had a couple of chances, but couldn't seem to find the target. Chester’s positive approach finally succeeded on the 62nd minute when Daggers’ goalkeeper Mark Cousins could only parry a Vose strike. The re-bound fell well for young midfielder Waters, and when he scored his delighted face was an absolute picture for the 137 travelling supporters. As there was still half an hour of play left, the Chester fans were getting very edgy remembering the events of 2017. So it was almost no surprise when Okenabirhie scored again with a good shot on the 85th minute. But the day’s disappointment was completed by Andy Halls' headed own goal just three minutes later. Despite four minutes of injury-time, there was no way back for Chester and it was yet another pointless visit to Victoria Road. Chester: Hornby, Halls, Hobson, Astles, Anderson (Waters 78), Mahon (Akintunde 78), Roberts, Crawford, Vose, Hannah, Archer (White 66). Subs not used: Firth, Dawson. Leyton Orient: Brill, Caprice, Widdowson, Happe, Bonne, Coulson, Koroma (Ling 82), Clay, Brophy, Holman (Lawless 69), Adams (Harrold 69). Subs not used: Grainger, Reynolds. Chester are unable to build on Saturday’s win as they lost by a single goal to Leyton Orient. Unsurprisingly Blues manager Marcus Bignot elected to keep the same starting X1 that played on Saturday against Eastleigh. Chester started well with Dean Brill in action early saving from a Ryan Astles header in the opening stages which youngster Tom CRawford made a great sliding challenge to deny Jake Caprice as Orient looked to strike on the break. 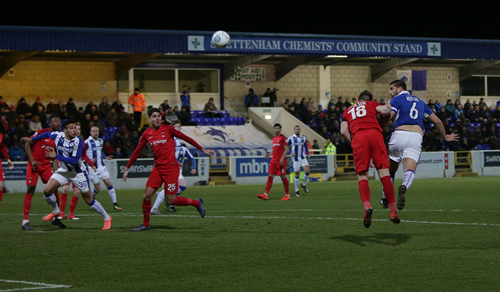 Gary Roberts was well placed to block a Josh Koroma effort when the O's striker really should have done better. Macauley Bonne was denied at the near post by a saving clearance from Shaun Hobson following a dangerous Caprice cross. Jordan Archer, Ross Hannah and Andy Halls were all seeing plenty of possession but the Blues couldn't break through the Orient back line. The visitors took the lead against the run of play on 70 minutes. Not for the first time Caprice exposed Myles Anderson down the flank, his low cross was met by a stooping James Brophy who headed home past Hornby. Bonne should have put the game beyond Chester with ten minutes remaining totally missing Koroma’s cross from two yards out. Chester: Hornby, Halls, Hobson, Astles, Anderson, Mahon (Akintunde 72), Crawford (Dawson 88), Roberts, Vose (Waters 90), Archer, Hannah. Subs not used: Firth, White. Eastleigh: Stack, Hoyte, Togwell, Cresswell, Wood, Yeates, Zebroski, Broom (Matthews 55), Hollands (Constable 76), Boyce, Williamson (McCallum 71). Subs not used: Obileye, Miley. 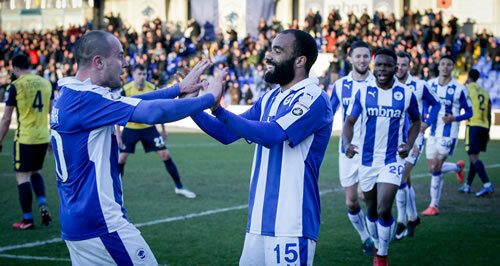 Chester gave a debut to midfielder Dominic Vose as the Blues looked to end a losing streak of six matches against the Spitfires. The Blues started well with Gary Roberts and youngster Tom Crawford dictating things in the middle of the pitch, and it wasn’t long before the Blues took the lead as Craig Mahon slid a through ball for Ross Hannah to chase, the striker chipping the ball over Graham Stack in the Eastleigh goal. The lead was short lived as just sixty seconds later the visitors drew level as Chris Zebroski saw an effort blocked by Ryan Astles but the loose ball fell to Mark Yeates who gave Sam Hornby in the Chester goal no chance. Another clinical through ball, this time from Vose, set Hannah away through on goal again but he was unable to get a shot away on target. Hornby produces a fine save to deny Yeates before Chester regained the lead. Andy Halls’ right wing cross was dropped by Stack under pressure from Roberts and Hannah was on hand to score from close range at the far post. Minutes into the second half Hannah almost grabbed his hat-trick seeing an effort crash back from the underside of the bar. At the other end Hornby produced another two fine saves to deny Sam Matthews and Yeates. Chester wrapped up the points in the final minute as Vose produced a great bit of skill to set up substitute James Akintunde who shot high into the roof to the net giving Stack no chance to seal a priceless victory. Woking: Baxter, Young, Staunton, Ralph, Ferdinand, Lathrope (Isaac 84), Carter, Cook, Banton (Jones 71), Orlu, Grego-Cox. Subs not used: Edwards, Saraiva, Mason. Chester: Hornby, Murombedzi, Rowe-Turner, Hobson, Astles, Mahon (Hannah 64), Roberts, James (Dawson 80), Akintunde, Archer, White. Subs not used: Firth, Crawford, Waters. Each time I visit Woking for a Chester match, it’s definitely a case of “more in hope, than expectation”. So it was with a doubting mind that I trudged through the freezing drizzle and into Kingfield via the aptly-named Moaners’ Corner. Chester started better than I’d seen them in 2018, with James Akintunde having an early shot after he ran through with the ball from midfield. It was fairly clear that Woking were nothing special, and the Blues initially seemed to be more 'up' for the game. But the home side started making more of an impression as the first half went on, and striker Reece Grego-Cox, on loan from QPR, had the ball in the net inside the first 15 minutes. 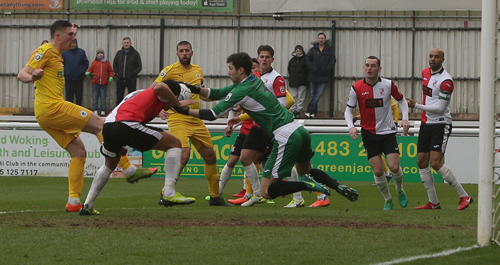 His strike was ruled out for offside, but it seemed to give Woking more confidence. Their efforts were rewarded on the 23rd minute when they won a corner, which seemed to take an unlucky bounce for Chester before the ball hit Woking’s Josh Staunton and somehow found its way into the net. One of Chester’s best chances of the game fell to Ryan Astles who headed for home from a Gary Roberts’ free kick. But his header was easily held by Woking goalkeeper Nathan Baxter, who is on loan from Chelsea. The Cards had a couple more chances before half-time, but it was the turn of Chester goalkeeper to be more than a match for the attackers. When referee Chris O’Donnell blew for half-time there’d only been one card showed during the game. But there were another seven cards in the second half, including a 58th minute red card for Woking's Matt Young for a late tackle on Akintunde. The sending-off seemed to spur Chester into more determined action, but they always seemed to come off second best when they got close to the Woking box. Their best chance fell to substitute Ross Hannah who did manage to beat Baxter, only to see his shot hit the crossbar. Jordan Archer also won the ball right in front of goal, but an attempted overhead kick was perhaps not the best way for him to find the net. It was all hands on deck in the Chester attack during the five minutes of added time, but they still couldn’t threaten the Woking goal. Grego-Cox actually had another good chance for the hosts in the final stages, but his shot also hit the woodwork to keep the score at 1-0 when full-time came.